College of Medicine – Can The Brain Help Heal The Heart? A College of Medicine scientist is advancing research on how neurons in the heart communicate with the brain in hopes of using those messages to repair cardiac disease. 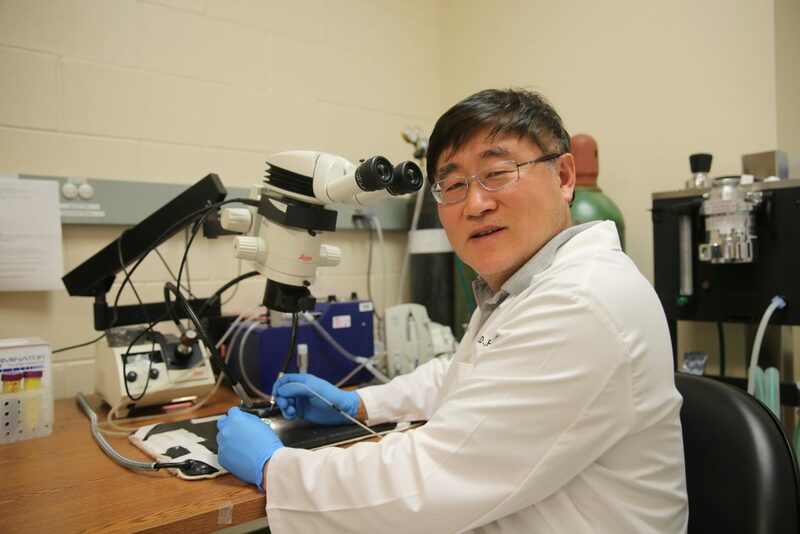 Dr. Zixi Cheng, a neuro-cardiovascular researcher at UCF’s Burnett School of Biomedical Sciences, recently received a $300,000 grant from the National Institutes of Health for his research on brain-heart interactions. Dr. Cheng’s lab studies communication pathways of neurons — cells that send and receive information from the brain using electrical signals. Most of the body’s neurons – roughly 100 billion – are found in the brain, although some are located in the organs including the gut and the heart. Dr. Cheng explains that the heart’s 4,000 to 5,000 neurons control the heartbeat and help the heart contract to circulate blood. Because the body has billions of neurons, their individual locations and functions are unclear. That’s why Dr. Cheng is developing a comprehensive topographical map that will show the body’s neurons and their connection to the heart. “Our research is trying to figure out how the nervous system is anatomically connected to the heart structure, by mapping the pathways of these neurons and identifying the their functions and how they control the heart,” Dr. Cheng explained. In mice models, Dr. Cheng injects different colored dyes into the heart so he can detect how heart neurons travel to the brain. Using a 3D imaging system, Dr. Cheng’s team is then able to create a digital interactive 3D map illustrating the communication pathways. “Following the pattern of movement of the dye, we are then able to map the pathways of the neurons as they send and receive signals from the brain to the heart,” Dr. Cheng says. The goal is to develop better life-saving therapies for conditions such as heart failure and arrhythmia. Current studies are exploring therapies that modulate nerve signals as potential ways to treat conditions such as hypertension and heart failure with better recovery and survival rates. Dr. Cheng’s grant is a sub-award from University of California, Los Angeles, the prime NIH SPARC recipient that leads a consortium of cardiology researchers from universities internationally participating in the research mission. SPARC, an acronym for Stimulating Peripheral Activity to Relieve Conditions, supports research into understanding nerve-to-organ interactions with the aim of developing better treatments for diseases and conditions.